PLAYER rings no bells for me, but the band has quite a history. 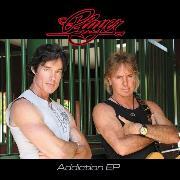 This EP contains their best remembered songs, of which their major hit from 1976, “Baby Come Back”, has been re-recorded. The original lineup of guitarist/lead vocalist Peter Beckett, guitarist JC Crowley, Bass player Ron Moss, and drummer John Friesen were in a flow as they got signed by RSO (home of the BEEGEES) and were taken aboard as special guests of ERIC CLAPTON on his American tour of 1978. Four albums were the result of their active touring years. Moss left and can be seen in the daytime TV-horror “The Bold and the Beautiful”, JC got into country music, and Beckett wrote songs for other artists and movie scores, as well as a stint with LITTLE RIVER BAND, and a solo album, “Beckett”. The PLAYER saga continued in 1995 when Moss and Beckett recorded album number five, “Lost in Reality” and toured the US. A new restart came in 2010, with Beckett and Moss joining with new members Rob Math, guitars, Johnny English, keyboards, and Craig Pilo on the drums. This is apparently a taster for an upcoming CD, so I guess the situation in the band must be fine. Opener “My Addiction” is quite slow, very pop-ish and rather outdated sound-wise. They do a lot better with “Too Many Reasons”, which feels very contemporary, and has many trademarks of the singer-songwriter genre. Their major hit “Baby Come Back” has been re-recorded. Crisp guitar notes, laidback to the point of extinction at times, and still very 70-ies in spirit it doesn´t really convince. I guess this will excite those into pop/rock, but I need more spark. All in all this is great songwriting but a little lukewarm.